Indiana state capitol in Indianapolis. 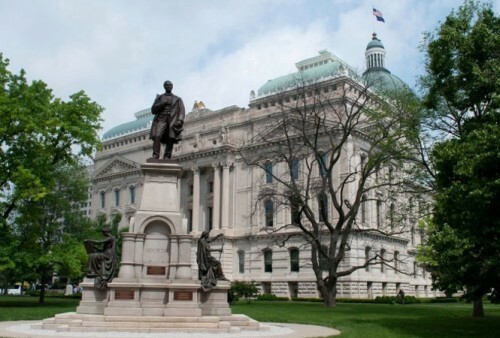 INDIANAPOLIS (AP) — The Carmel City Council has narrowly passed an ordinance banning discrimination based on a person’s sexual orientation and gender identity, defeating efforts by social conservatives to block the measure in the affluent Indianapolis suburb. Carmel High School graduate Amanda Joseph, who is gay, urged the council to pass the ordinance. She said that without the protections, she could be evicted from her apartment just for being gay. Columbus, Zionsville, Terre Haute, Hammond and Muncie recently passed similar ordinances, joining Indianapolis and about a dozen other Indiana communities that already had such LGBT protections in place. Indiana does not have statewide LGBT civil rights protections, but a growing number of groups are ratcheting up pressure on the Legislature to approve such protections. Indiana Senate Minority Leader Tim Lanane, D-Anderson, said Tuesday that the Democratic caucus will sponsor a bill next legislative session that would add the phrases “sexual orientation” and “gender identity” to Indiana’s existing civil rights code. “If added to the law, we will fulfill what I believe is a very basic, fundamental Hoosier value, which says that all Hoosiers deserve equal protection under the law. There’s no room for short cuts or half measures or exceptions,” he said. The debate over those protections was spurred by a national uproar last spring when Republican Gov. Mike Pence signed a religious objections law passed by the Republican-dominated Legislature. Critics said that law would allow people to discriminate against LGBT residents. The Legislature later amended the law to bar businesses from using it as a legal defense to refuse to provide services, goods, facilities or accommodations on religious grounds.